I encourage you to read the article and think about the video (otherwise the rest of this post will be less than illuminating). 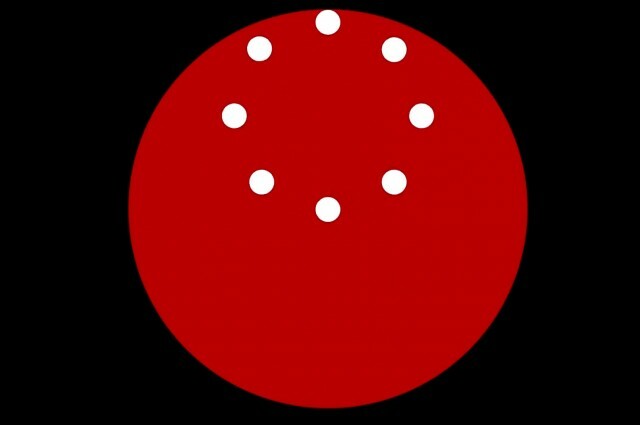 Supposedly, there is an “optical illusion” in the video because you think there’s a wheel when in “reality” the dots are moving linearly. This is not an illusion. The dots are moving linearly, that’s true. But there is also a wheel. If this causes you cognitive dissonance, so be it. It is not a paradox, however. It is the case that some wheels, when spinning inside other wheels, have points on them which travel linearly. I admit, this is a field of mathematics close to my heart. Much of my recent work has involved geometric phase, which has connections to Spirographs, epitrochoids and hypotrochoids as mentioned in the IFLS article. I have battered notebooks with over 500 pages of algebra devoted to such things. This is something I know something about. If you need to, CLEAR the picture, input the above parameters, and hit DRAW. Hit DRAW again to watch it all over again. There’s no illusion. A circle is rotating inside another circle. Simultaneously, a particular part of that circle is traversing a straight line. This comes as a surprise to many people: there’s a frisson of incredulity from the idea that your motion can be simultaneously linear, but curved as well. But there’s an easy explanation. Your motion is different in different frames of reference. Consider an ant on the wheel. With respect to the center of that wheel, he just orbits in a circular manner. But with respect to us, outside of the contraption, he moves back and forth along a single line. This is not an optical illusion. It’s the relativity of geometric shapes. And I think that’s even cooler than some cognitive trickery.